Yesterday I promised you pictures of the greenhouse project so today here are a few. It doesn't look like much here in the beginning but the work we did today was very important. Today my father and I put in the posts. Posts set in concrete was the best option for the shed-greenhouse idea that I wanted. Originally when I was thinking about building a shed I considered the pier idea. That works fine for shed but due to the amount of glass going into this and the fact that I wanted good drainage for inside the greenhouse I needed a porous surface like gravel. 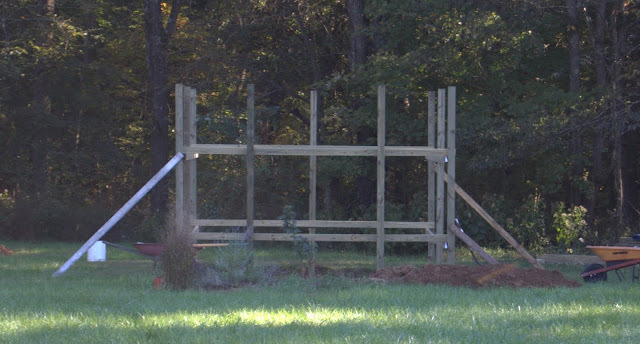 Set nine 10 foot long 4x4 posts into the ground 18 inches with 6 inches of gravel below. I may have used more or less gravel per post depending upon what was needed get them level. Leveled and aligned each post multiple times to make sure they were square plum and as perfect as possible! Setting the posts correctly is the most important part of this project. Since everything rests upon these 9 pillars pressure treated lumber we took extra care with the alignment. When we completed our leveling, aligning and measuring we were 1/4" off between the two sides. To me that's pretty darn good! 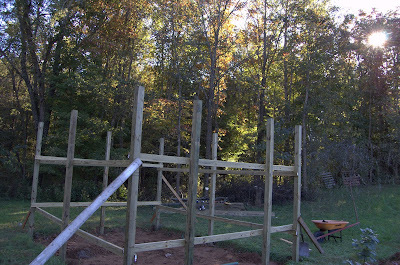 You'll notice in the pictures that there are several 2x4 cross bars tying the structure together. We used these to help hold the structure as we were setting and leveling the posts. We started with the right side by measuring and marking lines where the 2"x4"s should go. Then we attached the 2"x4" pieces together across the 4"x4" while they were laying on the ground. After that we raised the side and attacked braces. We did the same for the opposite side then hooked 12' long 2"x4" pieces to tie the sides together. All of this created the network of lumber you see in the picture. 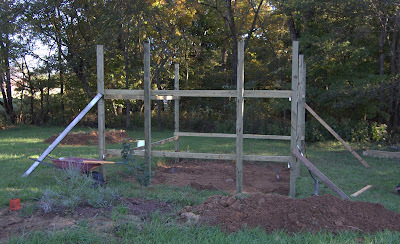 The 2"x4"s will come down and be used for other parts of the greenhouse structure once the sides are framed together. Their main purpose was to enable us to get the posts leveled correctly. 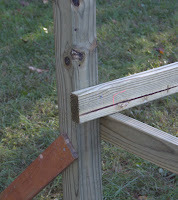 In the picture to the left you can see how we pieced the cross braces onto the 4"x4" posts. There's a lot more to do (obviously) but I'm proud that the most important part was accomplished as well as it was. Having the structure as plum and square as it is will enable all the rest of our work to go better and (hopefully) faster!